We are delighted to feature this excerpt from Lily Barlow, the Mystery of Jane Dough by Carla Vergot, Haymarket resident and longtime writer for The Piedmont Virginian. 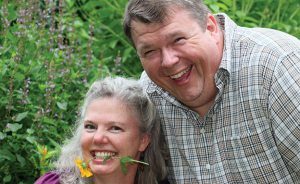 We have long appreciated Carla’s writing, which revolves around her garden as it helps her through life’s ups and downs in stories related with a dry humor and sometimes heartbreaking honesty. Lily Barlow, the Mystery of Jane Dough is part romance, part mystery, and totally entertaining. It’s set in Marshall, Virginia, and stars Lily Barlow, a UVA co-ed who comes back home begrudgingly to deal with her family’s struggling bakery, her best friend Jack (who suddenly wants to be more than friends), a quirky landlord, and some aggressive chickens, all while trying to solve a mystery of an unidentified murder victim. We couldn’t put it down, and you won’t be able to either. Without so much as a handshake, I had my apartment. Cleaner and more comfortable than I could have hoped… It was around six p.m. when I jumped in the Wrangler…My destination was Cinco Sombreros, a small, turquoise-colored Mexican dive on the edge of town…I didn’t bother to text [Mercedes]. She’d be there. She was always there. “Learn to love it?” I couldn’t have sounded more incredulous. “Stephanie Plum,” I corrected, tartly. I didn’t have time to respond. From my stool, I watched Wayne Davis and Joe Turner meander into the restaurant. Hell’s bells and sizzling snowflakes. The place was mostly empty, but they made their way to the one table that was annoyingly close to our spot at the bar. Joe circled around and pulled me off my perch. “Lily Barlow. Mmh, girl.” He leaned in for a hug. “When’d you get home?” Hugging was kind of a standard greeting in these parts, so after Joe, I stepped over and gave Wayne a hug. On the slim chance Jack didn’t know I was home, I gave it about fifteen seconds before he heard it from Joe. I watched a waitress drop two bottles at their table, and in my peripheral vision I saw Joe punching something into his phone. Didn’t matter. I was fixin’ to leave anyway. I got up to hug Mercedes, which, like any alcohol-laced goodbye, took longer than necessary. During the process, I was surprised when a strong arm came from behind and pulled me into a broad, hard chest. I felt a kiss land on the side of my head. He helped me out and I dug for the orange starfish in my pocket. The stairs looked a little steeper than they had this afternoon, and I leaned on him, enjoying his clean soapy smell. Then I asked him a question which showed I definitely had too much to drink. “We’ve been friends for a long time,” I started. It looked like he was adding it up in his head. “Sixteen years, right?” He filled in the number. I stumbled on the next step, but I didn’t know if it was from the buzz or this new information. “Tonight?” I suggested, surprising myself. He took the key, unlocked the door, and maneuvered me toward the bathroom. The place was small, so there were only two doors it could be. “Yes,” I insisted, holding the doorknob tight. “No, Lily. About sleeping together.” He let himself out before I could process the comment, let alone formulate a reply. I was still thinking about it five seconds later when he rapped on the other side of the door. Clicking the deadbolt, I heard his heavy boots disappear down the steps, but I side-stepped to the little window and moved the curtain an inch to spy. Jack stopped by his truck. I saw him tip his Washington Nationals ball cap, something he did when greeting women. Was he talking to somebody in the yard? Miss Delphine? I could make out a shadow at the dark end of the porch and a slow, rhythmic movement. Was she in the rocking chair? He nodded in that direction, got in the truck and left. Back on the couch, I finished the glass of water, wished I had another beer, and tried to remember something from the bar. Something Mercedes told me to do. Google something? What was it? Something to eat? P fruits? No…No…Dough! Yes, google dough. Embrace the dough. Be the dough. I flipped open the Mac, stumbled over to the fridge for the WiFi code, checked the fridge in case the last tenant left a bottle of beer in there, cursed the last tenant for drinking all the beer, and headed back to the living room. A notoriously bad speller, my hazy mind and slow fingers were not helpful, so the first thing that made it into the search window was the wrong kind of dough. I typed the letters d-o-e and hit enter. It was a chicken noise that roused me from the hypnotic Doe stupor at five thirty a.m. I hadn’t been to bed. In fact, I hadn’t moved more than a few inches within the burrow of macramé pillows on the couch. Remembering my commitment to feed Miss Delphine’s chickens, I slipped on a pair of lime green flip flops and took the stairs nice and slow ‘cause of the hangover. At the bottom, I encountered one of them blocking my way. We stared each other down for about thirty seconds. “What?” I said from the couch. I watched him take in my messy brown ponytail and overall rumpled appearance. He seemed to notice I was still wearing the shorts and Abercrombie tee I had on yesterday. In mid coffee-sip, I shook my head no, avoiding his blue eyes. “Why not?” he asked, genuinely confounded. “Jack, you don’t want to know,” I sighed. “Literally, more than anything.” He grinned. “Down in the truck. Cover your ears while I test this one.” He was standing on a kitchen chair, which didn’t look safe at all. The smoke alarm only made a few sickly chirps. He popped the cover and replaced the battery. With that one in good working order, he pulled the chair into the bedroom and got to work screwing one to the ceiling in there. “Is that for when I’m in here burning up the sheets with my latest conquest?” I smirked from the doorway. “For when we’re in here burning up the sheets.” Over his shoulder he gave me one of his trademark winks. Was that a reference left over from something we talked about last night? Good Lord, did we kiss or something? Impossible. But there was an idea nagging me. I just couldn’t pull it out of the dark, drunk corner of my mind. “Lily, you can change the subject all you want, but we will have this discussion before you head back to school.” He squeezed his 6’4 frame past my 5’8 frame, going slow on purpose. Want to find out what happens next? 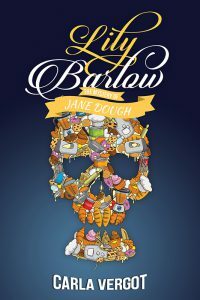 Order Lily Barlow, The Mystery of Jane Dough on Amazon here. Available in Kindle, Audiobook, and paperback!